I’ve been meaning to write this post for a while. I’ve even had some thoughts jotted down in my blog software for over a couple of months, but haven’t had time to sit down and write them into meaningful prose. Then recently a few friends have asked me about our slings, so I thought it was time I knuckled down and got this published! We started off with a stretchy wrap – Moby was the brand I went for (amongst others available) because I loved the black and white lace design that I found when most stretchies on the market seemed to be plain. Looking back this was a fantastic way to get into babywearing. The first few times I tried to tie it were a little tricky, but I soon got the hang of it and could do it blindfolded whilst entertaining a toddler (well, maybe not quite, but you get the idea!) Whenever people commented on how hard it must be to wrap and how easy I made it look, my response would be along the lines of: “it’s like tying a shoelace – when you first learn as a kid it’s pretty hard, but once you repeat the task several times a day, it soon becomes automatic.” When wrapped around us both, it was comfortable and effortless to carry Joel. He would mostly fall asleep in it, and was most settled there compared to other places. I wished I’d known about these wraps when Andrew was a baby, but you can only do the best you can with the information you have at the time. 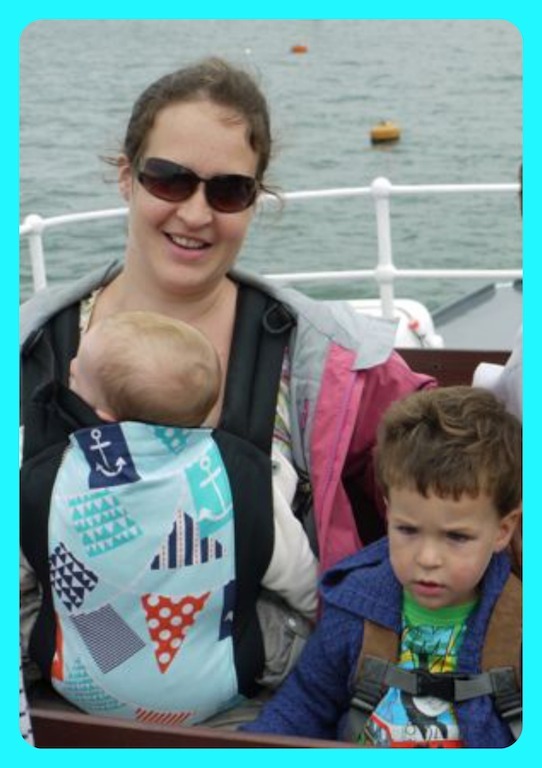 Although it would have been handy, I guess it was even handier when I had two boys to look after – holding Joel handsfree was fundamental to our ability to get through the day with the three of us fed, watered and out in the fresh air. I honestly don’t know how mums cope with a second child and without a comfortable sling. Once Joel hit 6 months, the stretchy wrap started to be less optimal. He was still comfy in it, but his increasing weight meant it stretched more and I would have to retie it more often to keep it snug. I’d been advised that stretchies don’t last much longer than 6 months (depending on baby’s weight/size), despite claims by the manufacturers. So I was on the look out for something to replace our faithful stretchy. Joel was (and still is!) tall for his age, so a front carry was becoming increasingly awkward when I also needed to push the buggy with Andrew in. He has always been an active little monkey, so by 6 months he was well on his way to crawling, and I found it increasingly difficult to wrap him quickly because he would wriggle all over the place. I thought it would be even harder to wrap him on my back whilst wriggling, and a stretchy wrap is no good for back carries anyway. 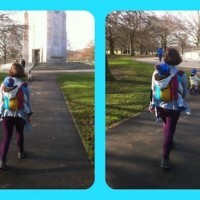 I did lots of research online and chatted to other mums in Facebook baby wearing groups and in person at the sling meet. That’s when I came across the Rose and Rebellion (or R&R) soft structured carrier (SSC for short). Whereas a wrap is one long piece of fabric that you tie around you and baby/toddler, a SSC is shaped and has straps with buckles that you wear a bit like a rucksack on your front or back with baby inside. The slings that are available on the high street (the Baby Bjorn is probably the most well known) are in effect a SSC, but they are usually not ergonomic – they generally don’t keep baby’s hips supported in a healthy ‘frog-leg’ position, instead they allow them to dangle, and they offer little back support to the parent, making them uncomfy for carrying a baby heavier than a newborn – this is exactly what I had experienced with carrying Andrew. On the other hand, a good ergonomic SSC like the R&R keeps both baby and parent supported in the right places, plus it comes in all sorts of funky designs. I kept a look out for one on a Facebook group where you can buy and sell wraps and (ergonomic) slings, and within a couple of weeks I grabbed a bargain in a lovely flag design, nice and boyish, that had only been worn a few times but was cheaper than buying new. There are lots of other makes of SSC to choose from, but I went for the R&R at the time because it fitted us well, was reasonably priced for a good quality handmade product, and I loved the print on in. We used this all summer. It went everywhere with us, and both Tom and I wore Joel everyday, particularly because he would only settle to sleep when worn in the sling. I suspect this was because it’s all he’d ever known and was so at ease being carried close to us, more so than if we put him in a buggy or worse still his cot (he’s never napped in his cot!) We loved this SSC, and it was a sad day when we had to admit that he was getting too big for it. You see a sling that is structured (as opposed to a wrap that can be used to wear any size of baby/toddler), by its very nature must be a sized item that will only fit a baby/toddler within a certain range of weight/height. The straps that fit around the parent are adjustable, which is why the R&R fitted both Tom and I very well, plus it would go much larger and a bit smaller for other sized parents, but the width of the panel of fabric supporting Joel’s legs eventually got too narrow and it was no longer ‘knee to knee’ – the term used to describe a sling that goes from just under one knee to just under the other and keeps the hips in the healthy spread position. At that point – Joel was around 10 months, but in 12-18 months clothes for height – I did some more looking online in the Facebook wrap and sling selling groups, to see what was available preloved in toddler sizes. There were some larger R&Rs that I liked, though not with a design as cool as the one we had. Then one day a very special sling came up for sale which grabbed my eye, and after sleeping on it overnight, I decided to buy. It’s another SSC, and it’s what is called a ‘wrap conversion full buckle’ – the ‘full buckle’ refers to the fact that the waist and shoulder straps have buckles rather than long ‘wrap-like’ straps that you would tie around your waist and shoulders (this would be called a ‘mai tei’ sling), and the ‘wrap conversion’ refers to the fact that the fabric of the SSC is a wrap that was once used to wear a baby but has been chopped up and sewn into a structured shape to make this new SSC. The lady who made it is a work at home mum (WAHM); many of the toddler-sized SSCs are made by small WAHM businesses – though all on sale in this country have to conform to British safety tests, just like the bigger brands. 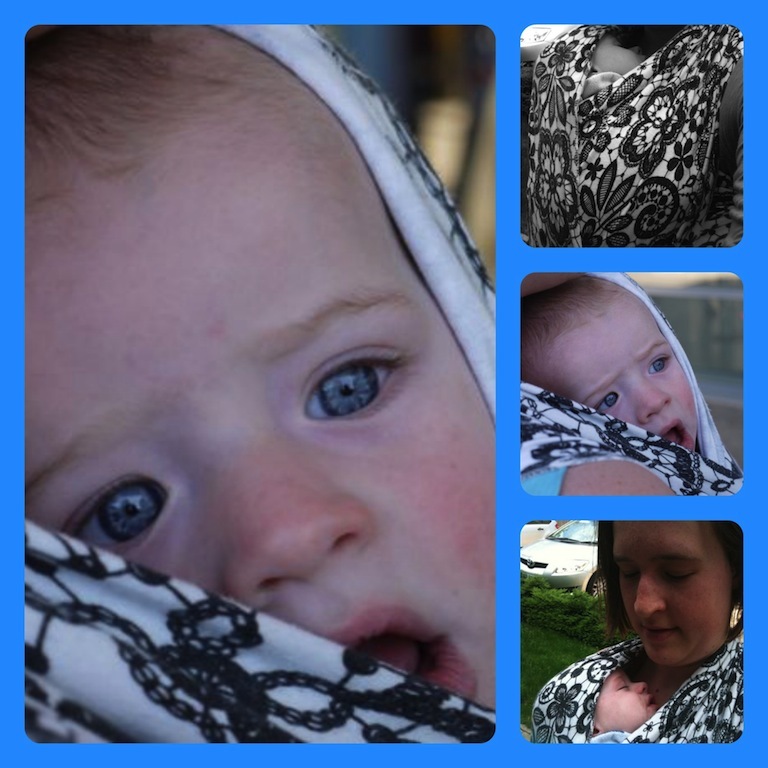 The wrap in my sling is from a German woven wrap company called KoKaDi, and the design is called ‘galaxy stars’. I love how comfortable this is on us – I think the wrap fabric really helps here, because it was designed to support a baby/toddler being worn. I hardly feel Joel’s weight on me and can wear him for hours perfectly comfortably. He loves being in there and still falls asleep most of the time when he’s being carried. I can even wear Andrew in this size of sling for short periods of time – again I don’t feel much of his weight when it’s evenly distributed in the sling, it’s a bit like a hands free piggy back. This sling is definitely here to stay for a while yet, until we need to get a preschooler size sling – which may be sooner rather than later at the rate that Joel is growing! A little while after I bought the wrap conversion sling, I decided that another type of sling would be handy for us too. Although most of our daily trips out and about are on foot, so the sling on my back is perfect for these distances, we do sometimes use the car to get somewhere and of course then walk at our destination – for example to some shops or a group that’s too far away to walk to. I was finding that I’d carry Joel on my hip and Andrew would walk, but this was proving very difficult when Joel wanted to wriggle off me and I was carrying anything else like bags too. 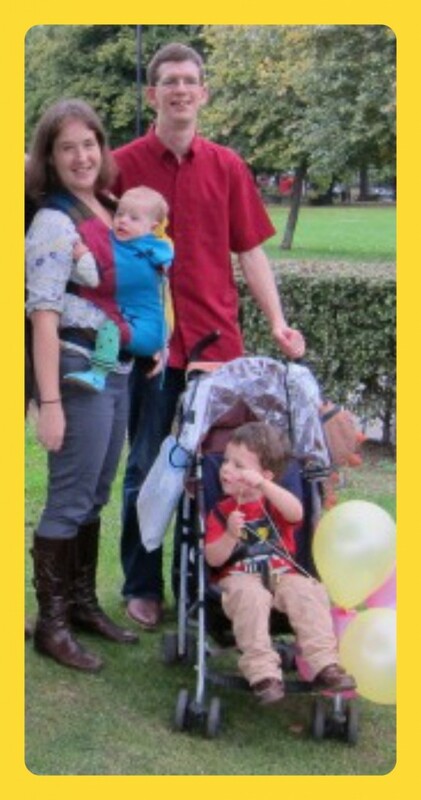 So I invested in a ring sling for carrying Joel on these short walks out from the car. This is a long(ish) piece of woven fabric, just like a long wrap, which has 2 metal rings threaded through that hold the fabric in place when carrying a baby/toddler on your hip. This now means that I can quickly nip Joel in the sling and have my hands free to carry bags and hold Andrew’s hand (or his reins) when walking. I’m really pleased with how easy this has made it to nip out in the car, and I love the design of it – I chose a wrap called Erna im Wunderland by KoKaDi because it has pink on it, one of my favourite colours, but the blue means it works well for carrying a boy too. Excuse the poor photography of the ring sling below – they were both taken at night, one with Joel wide awake, and the other when I’d swayed him back off to sleep in it when he was poorly. 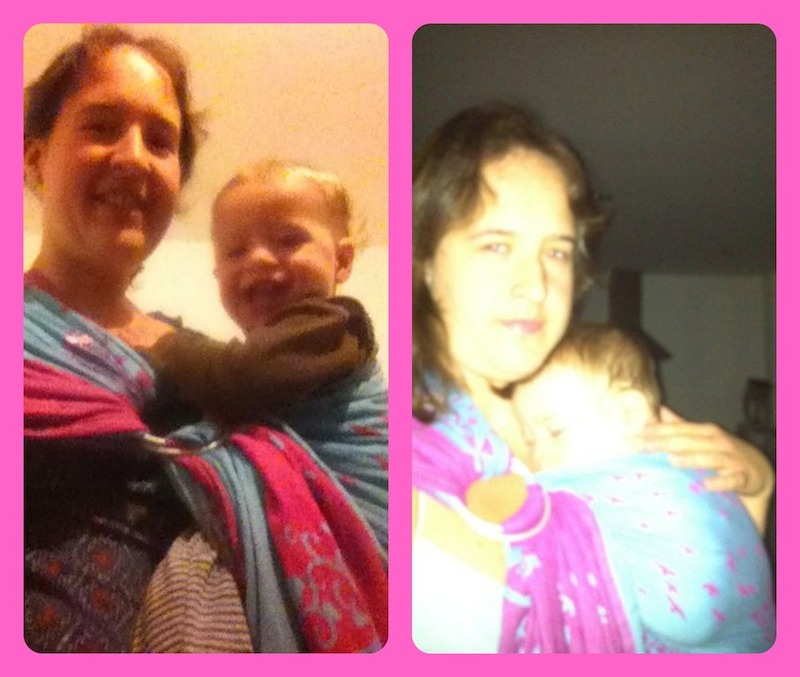 It may seem a little extravagant to have bought 4 slings (though this is nothing compared to some of the mums I know in online groups who have declared themselves wrap/sling addicts! ), but the great thing about good quality slings and wraps is that they retain their value and can be sold on in good condition for a fair amount of their retail price. The Moby and the R&R each cost me £15 when I calculate what I paid minus what I got back. I imagine it will be similar for the toddler sling and the ring sling. So this is where we’re at in our baby-toddler-wearing journey. Some people ask how I can carry them now they are both pretty hefty, but actually it’s a lot easier to carry a toddler in a sling than in your arms, because the weight is more evenly distributed and you don’t feel the weight as much like this. Slings are more practical than buggies in many ways too, though that’s not to say that our buggy doesn’t have good use too with 2 toddlers to transport about. 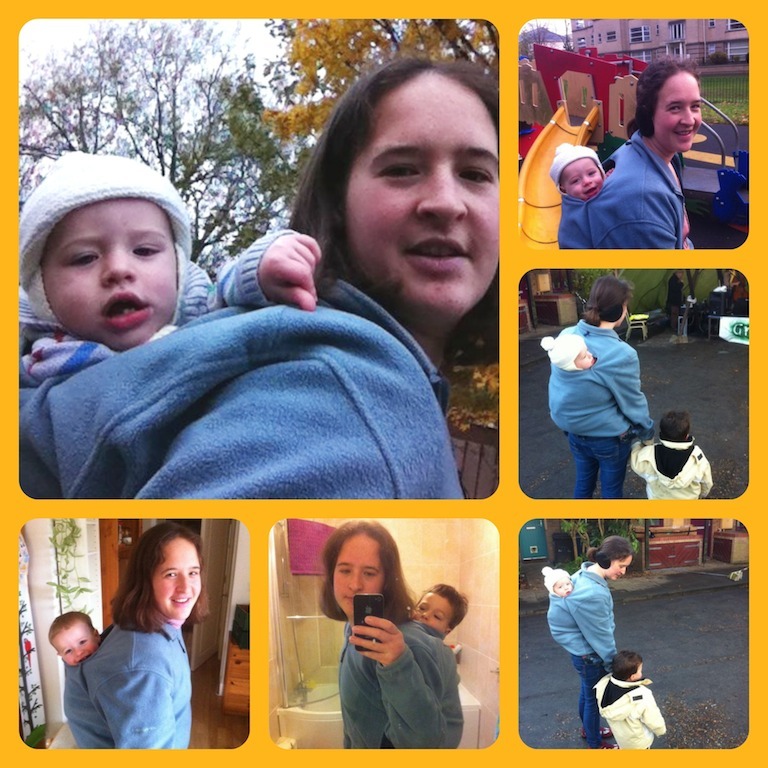 I’m planning on wearing both boys for as long as they would like – even at 3 Andrew loves the occasional ‘piggy back’ with the aid of the sling, and Joel is such a happy little boy on my back. Disclaimer: All opinions expressed are my own, based on our positive experiences. I have received no incentive from any business that I have mentioned in this post. Next Next post: Rocket’s the word – wot so funee?